Please note that Google and Yahoo Logins are no longer supported. Please reset your password to access your account. (UTC-12:00) International Date Line West (UTC-11:00) Coordinated Universal Time-11 (UTC-10:00) Hawaii (UTC-09:00) Alaska (UTC-08:00) Baja California (UTC-08:00) Pacific Time (US & Canada) (UTC-07:00) Arizona (UTC-07:00) Chihuahua, La Paz, Mazatlan (UTC-07:00) Mountain Time (US & Canada) (UTC-06:00) Central America (UTC-06:00) Central Time (US & Canada) (UTC-06:00) Guadalajara, Mexico City, Monterrey (UTC-06:00) Saskatchewan (UTC-05:00) Bogota, Lima, Quito (UTC-05:00) Eastern Time (US & Canada) (UTC-05:00) Indiana (East) (UTC-04:30) Caracas (UTC-04:00) Asuncion (UTC-04:00) Atlantic Time (Canada) (UTC-04:00) Cuiaba (UTC-04:00) Georgetown, La Paz, Manaus, San Juan (UTC-04:00) Santiago (UTC-03:30) Newfoundland (UTC-03:00) Brasilia (UTC-03:00) Buenos Aires (UTC-03:00) Cayenne, Fortaleza (UTC-03:00) Greenland (UTC-03:00) Montevideo (UTC-03:00) Salvador (UTC-02:00) Coordinated Universal Time-02 (UTC-02:00) Mid-Atlantic (UTC-01:00) Azores (UTC-01:00) Cape Verde Is. (UTC) Casablanca (UTC) Coordinated Universal Time (UTC) Dublin, Edinburgh, Lisbon, London (UTC) Monrovia, Reykjavik (UTC+01:00) Amsterdam, Berlin, Bern, Rome, Stockholm, Vienna (UTC+01:00) Belgrade, Bratislava, Budapest, Ljubljana, Prague (UTC+01:00) Brussels, Copenhagen, Madrid, Paris (UTC+01:00) Sarajevo, Skopje, Warsaw, Zagreb (UTC+01:00) West Central Africa (UTC+01:00) Windhoek (UTC+02:00) Athens, Bucharest (UTC+02:00) Beirut (UTC+02:00) Cairo (UTC+02:00) Damascus (UTC+02:00) E. Europe (UTC+02:00) Harare, Pretoria (UTC+02:00) Helsinki, Kyiv, Riga, Sofia, Tallinn, Vilnius (UTC+02:00) Istanbul (UTC+02:00) Jerusalem (UTC+03:00) Amman (UTC+03:00) Baghdad (UTC+03:00) Kaliningrad, Minsk (UTC+03:00) Kuwait, Riyadh (UTC+03:00) Nairobi (UTC+03:30) Tehran (UTC+04:00) Abu Dhabi, Muscat (UTC+04:00) Baku (UTC+04:00) Moscow, St. Petersburg, Volgograd (UTC+04:00) Port Louis (UTC+04:00) Tbilisi (UTC+04:00) Yerevan (UTC+04:30) Kabul (UTC+05:00) Islamabad, Karachi (UTC+05:00) Tashkent (UTC+05:30) Chennai, Kolkata, Mumbai, New Delhi (UTC+05:30) Sri Jayawardenepura (UTC+05:45) Kathmandu (UTC+06:00) Astana (UTC+06:00) Dhaka (UTC+06:00) Ekaterinburg (UTC+06:30) Yangon (Rangoon) (UTC+07:00) Bangkok, Hanoi, Jakarta (UTC+07:00) Novosibirsk (UTC+08:00) Beijing, Chongqing, Hong Kong, Urumqi (UTC+08:00) Krasnoyarsk (UTC+08:00) Kuala Lumpur, Singapore (UTC+08:00) Perth (UTC+08:00) Taipei (UTC+08:00) Ulaanbaatar (UTC+09:00) Irkutsk (UTC+09:00) Osaka, Sapporo, Tokyo (UTC+09:00) Seoul (UTC+09:30) Adelaide (UTC+09:30) Darwin (UTC+10:00) Brisbane (UTC+10:00) Canberra, Melbourne, Sydney (UTC+10:00) Guam, Port Moresby (UTC+10:00) Hobart (UTC+10:00) Yakutsk (UTC+11:00) Solomon Is., New Caledonia (UTC+11:00) Vladivostok (UTC+12:00) Auckland, Wellington (UTC+12:00) Coordinated Universal Time+12 (UTC+12:00) Fiji (UTC+12:00) Magadan (UTC+12:00) Petropavlovsk-Kamchatsky - Old (UTC+13:00) Nuku'alofa (UTC+13:00) Samoa I have read and agree to the Terms of Service. 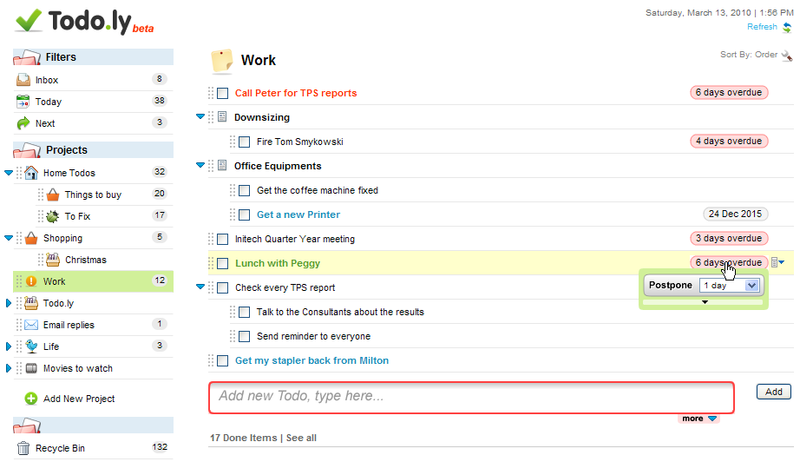 Todo.ly is an intuitive and easy to use online Todo list, and Task Manager. It helps you to get organized, simplify your life, and to get things done. 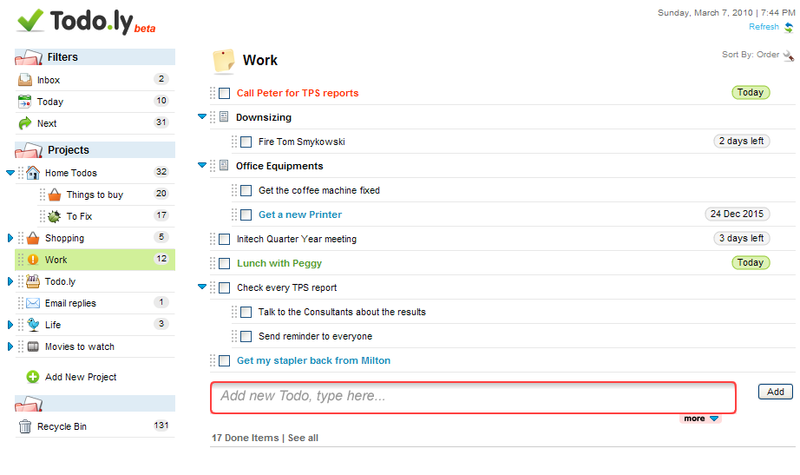 Create todo lists, and manage them online from anywhere. Easy to use filters to only focus on the next things you need to do. 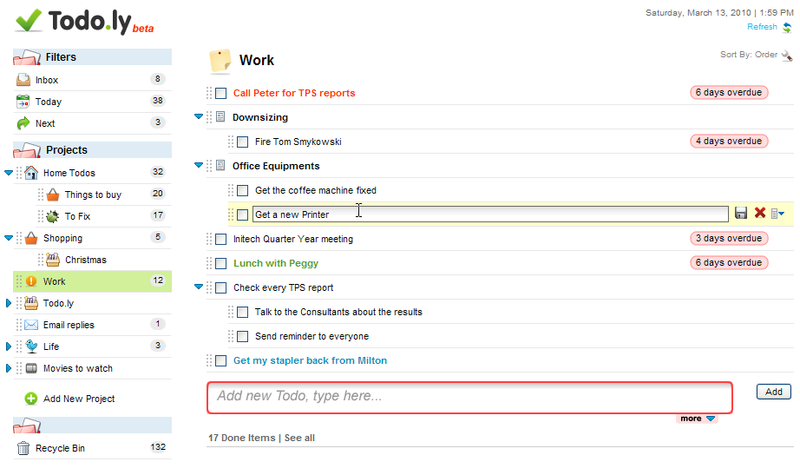 New tasks are placed in your Inbox until you assign them Due Date, or move them to a Project. Smart Filters are according the famous Getting Things Done method. Create separate Projects for different kinds of tasks. Todo.ly helps you to easily create new projects and sub projects. You can simply drag and drop them into each other. Select icons for your projects to highlight them even more. Managing Tasks and Projects can't be easier! 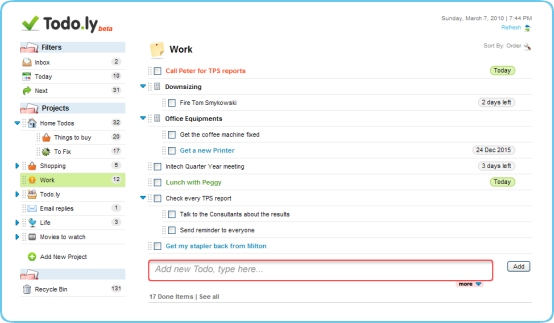 With the intuitive drag and drop you can simply move your task from one project to another. 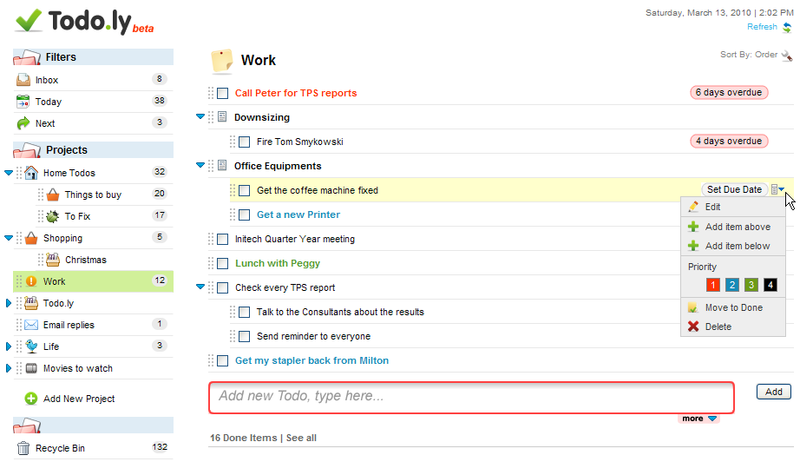 Hover on your tasks, grab it and move it to different project, or just simply put it into a group of tasks. 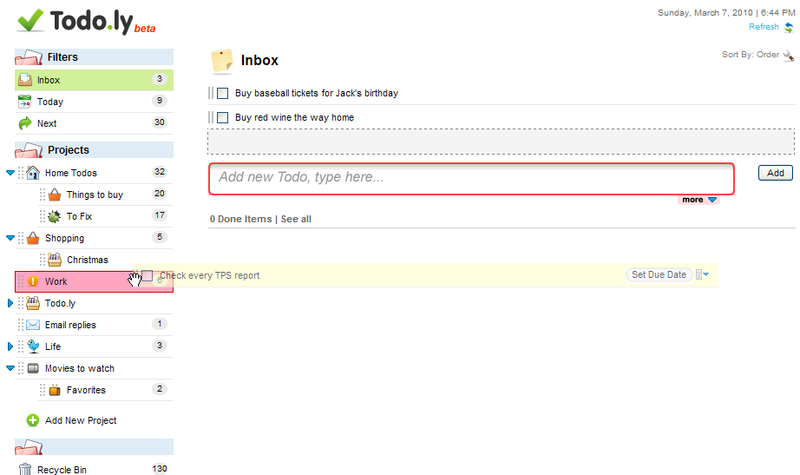 Todo.ly is designed to be as clear and simple as possible. Keeping that in mind you can find a bunch of additional features placed into easy to access right click menus. You only see them when you need them. Look for the 'options' icon when you hover an item. 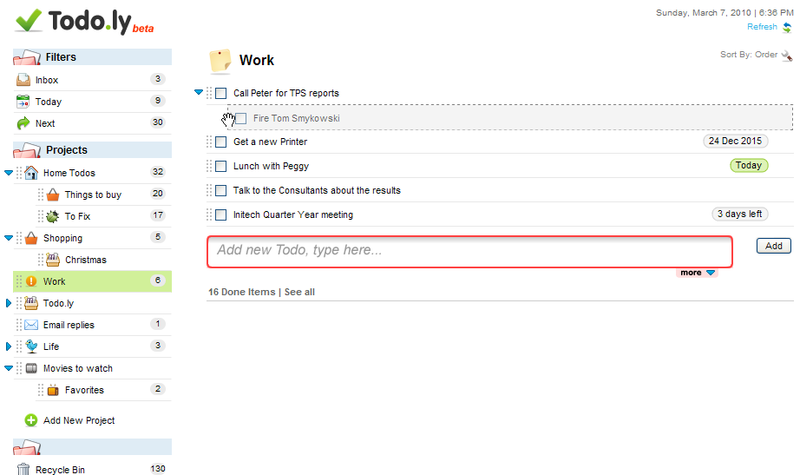 If you have related tasks simply organize them to groups. You can create unlimited level of Projects and Tasks. 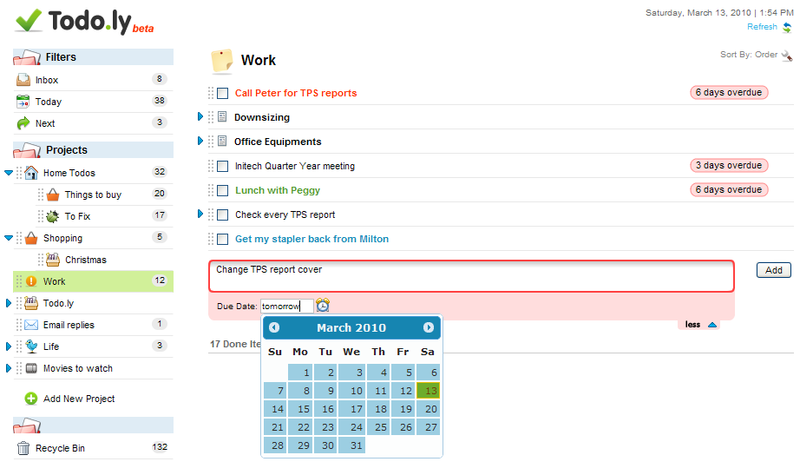 It's easy to prioritize the tasks within the group using different colorings, or just changing the order of the tasks via drag and drop. 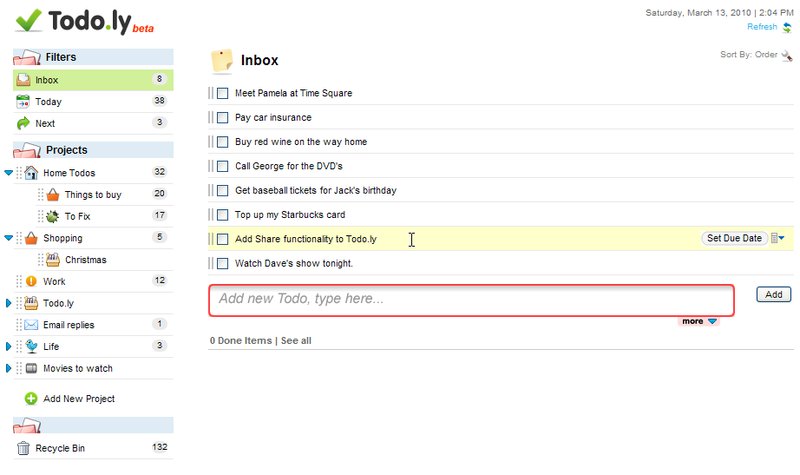 We designed Todo.ly for intensive everyday work. 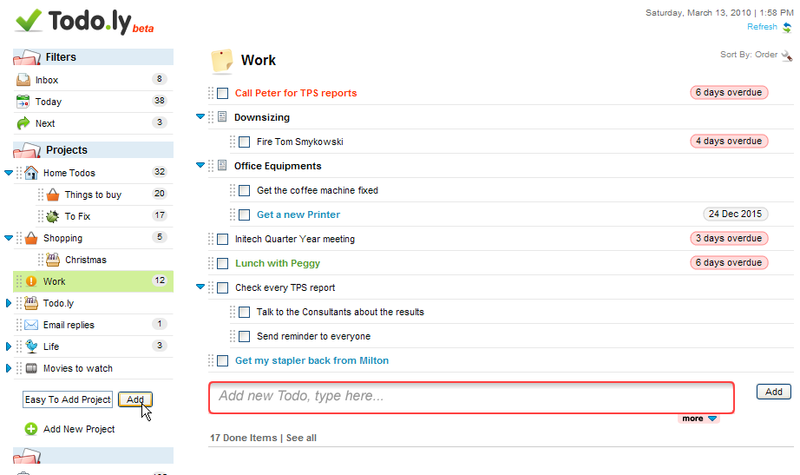 There is no need to hassle with Edit screen, and separate pages to edit a task. Just click on a task and you are already editing it. It is simple as that. Press Escape to cancel editing or press enter to save it. Assign due dates to your tasks to not forget them. Tasks will pop into your Today list as due dates approach. Sort the tasks within the project by Due Date to see what you need to focus next. Postponing a task is just a simple click away. Choose when you plan to finish the task (1 day, 1 week, 1 month.. etc), and simply Postpone it. It's better postponing a task than having a busy list with all the tasks you still haven't done.